Then blood appears on her doorstep – blood, and broken glass. As the attacks become more sinister, Lin doesn’t know who to trust. She’s getting closer to the truth behind these chilling discoveries, but with each move the danger deepens. 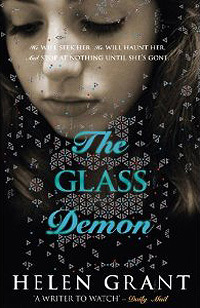 After a discussion about YA thrillers and horror, Helen kindly arranged for her publisher to send me out a copy of The Glass Demon to try. Helen seems to be classed as a YA writer, but this particular book would definitely appeal to all age groups (as do many YA books, of course). It’s actually a difficult book to classify, as it’s unclear for most of the story whether this is a straightforward thriller, or if there’s a supernatural element. I felt this added just the right level of uneasiness, and I won’t spoil the story for anyone by revealing which it is. The story revolves around a mysterious set of stained glass windows – most people deem them to no longer exist, and yet there are some who believe they are hidden away. Lin’s father is a historian, and the Allerheiligen Glass is his latest obsession. The Glass is also meant to be haunted by a demon, who can kill anyone who looks at him. As people start to die around Lin, and strange things occur, she realises that her and her family are in danger, but she doesn’t know who from. Add to this that she’s been taken by her father to Germany, and she’s trying to fit into a new school, and cope with the attention of their nearest neighbour, Michael!